Sharks can shed thousands of teeth during their lifetime, but the teeth you’ll find on our beaches come from sharks that were swimming millions of years ago. They’re fossilized, having been embedded in sediment and preserved with inorganic minerals. You can also find plenty of teeth—some incorporated into jewelry and crafts—at nearby stores, as well as at the annual Shark’s Tooth Festival (April 7-9). 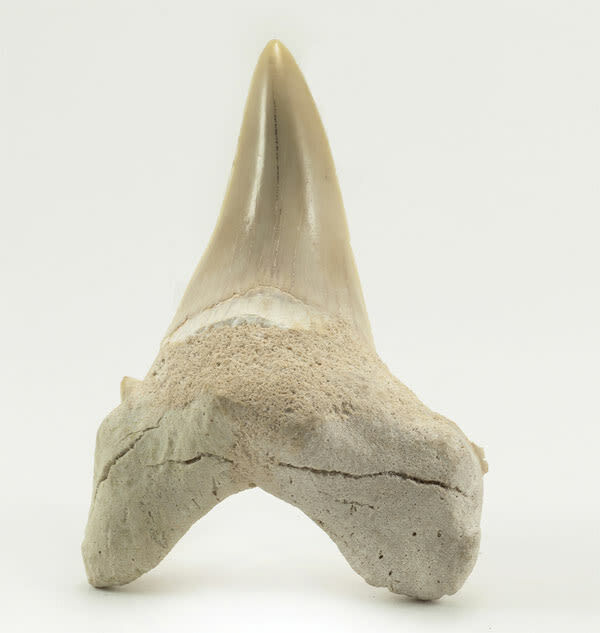 Millions of years ago, when Florida was mostly underwater, sharks’ teeth and other prehistoric fragments were trapped by sediment. Local portions of exposed sediment and erosion from the Peace River have freed up the fossils for modern-day treasure hunters. Sharp-eyed treasure hunters might stroll the shoreline (low tide is best). Others might prefer digging and sifting with a “Florida snow shovel” (the widely available sieve-on-a-stick). But some say the best method for tooth-hunting is to snorkel or scuba dive, searching the sandy bottom just offshore. Native Floridians used these hardened, pre-sharpened objects for all manner of tools—not only as arrowheads and spear points but also as wood-carving implements and even for trade purposes. Shark skeletons are almost entirely cartilage, which breaks down much faster than bone. The rest of the skeleton rarely sticks around long enough to get fossilized. The most common teeth you’ll find will be an inch long or smaller, and may be from a sand tiger shark, reef shark or lemon shark. Less common may be from extinct species like giant makos, snaggletooths or even megalodons. The annual Venice Shark’s Tooth Festival takes place April 7-9 at the Venice Airport Festival Grounds.